"Brush cell" redirects here. For the neuron, see Unipolar brush cell. A brush border (striated border or brush border membrane) is the microvilli-covered surface of simple cuboidal epithelium and simple columnar epithelium cells found in certain locations of the body. Microvilli are approximately 100 nanometers in diameter and their length varies from approximately 100 to 2,000 nanometers in length. Because individual microvilli are so small and are tightly packed in the brush border, individual microvilli can only be resolved using electron microscopes; with a light microscope they can usually only be seen collectively as a fuzzy fringe at the surface of the epithelium. This fuzzy appearance gave rise to the term brush border, as early anatomists noted that this structure appeared very much like the bristles of a paintbrush. 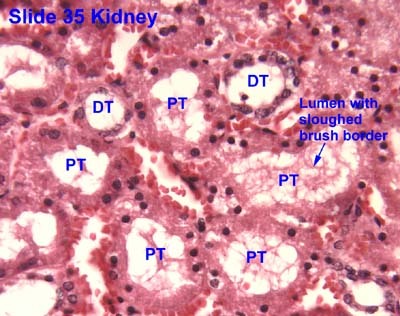 The kidney: Here the brush border is useful in distinguishing the proximal tubule (which possesses the brush border) from the distal tubule (which does not). The large intestine also has microvilli on the surface of its colonocytes (alternative name for enterocytes). 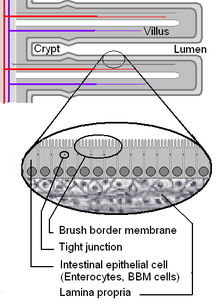 The brush border morphology increases a cell's surface area, a trait which is especially useful in absorptive cells. Cells that absorb substances need a large surface area in contact with the substance to be efficient. In intestinal cells, the microvilli are referred to as striated border and are protoplasmic extensions contrary to villi which are submucosal folds, while in the kidneys, microvilli are referred to as brush border. ↑ Histology image:21901loa from Vaughan, Deborah (2002). A Learning System in Histology: CD-ROM and Guide. Oxford University Press. ISBN 978-0195151732. ↑ Histology image:12202loa from Vaughan, Deborah (2002). A Learning System in Histology: CD-ROM and Guide. Oxford University Press. ISBN 978-0195151732. ↑ Histology image:11703loa from Vaughan, Deborah (2002). A Learning System in Histology: CD-ROM and Guide. Oxford University Press. ISBN 978-0195151732. ↑ Histology at KUMC urinary-renal13 "Tubules"
↑ Ross, Michael H. Histology : a text and atlas / Michael H. Ross, Wojech Pawlina., -5th ed. p 102.